If you can bunny hop properly on your bike, jumping up a few steps is straight forward. 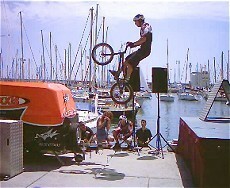 A pure street trials technique, flat and square. 1° Stop pedaling and flex to prepare for extension. Then lean back to lift the front wheel while pushing on the rear wheel (see the flat tyre). 2° Make a full extension, in one jump impulse on the pedals at the highest position, to take off the rear tyre from the ground. 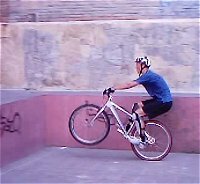 3° As soon as the back wheel takes off, tuck back, pulling on the bars upwards while lifting the knees. That is what brings the bike up. 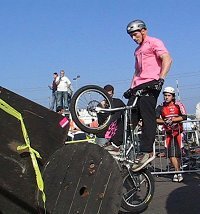 This approach is not very safe for higher obstacles, as the front wheel can accidentally bang on the upper edge of the wall, stopping you straight, or sending you over the bars if you go fast enough. You also need enough flat space to accelerate. If you have a 'last second' problem lifting the front wheel, you're up for a nasty crash. Bunny Hops are very energy consuming, you literally jump on top of a very short manual and then try to pull up the bike with you, but it can be very classy if you land sharp. In the slow motion rear view, you can see how the bike is pulled up while the body is tucking up after the jump extension. 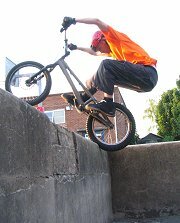 Start on smallish kerbs before you consider breaking your bones on higher stuff. One trick that boosts the impulse up is to bounce-up the front wheel by pushing down on the bars firmly before crouching back for your jump impulse. 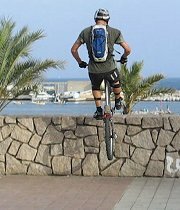 This makes it easier to lift the front wheel in synchronization with your full extension. The next technique is to roll over the obstacle. Quite safe, this is a true biketrials technique and it requires very little run-up space (one pedal stroke). And it is a much smoother move, as you don't need to pull like mad on the handlebars. You don't land on the rear wheel but it's more like rolling up and stopping once on the obstacle. At a pro level, you can bunny hop with minimal run-up distance, stretching to the limits synchronised body movement.